BELIZE CITY, Fri. Apr. 8, 2016–Winning the Annual Cross Country Cycling Race is the dream of every cyclist who enters the race and rides the 144 miles from Belize City to San Ignacio and back. 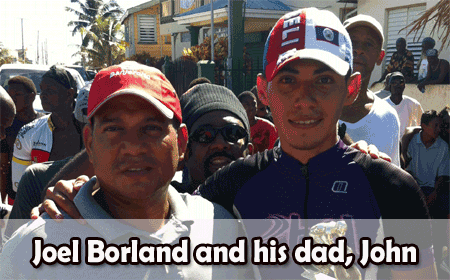 It takes discipline, endurance, stamina and above all, teamwork to carve out a win in the biggest sporting event in Belize and this year, two Guatemalan brothers took away Belize’s coveted Cross Country Garland, while Belizean cyclist Joel Borland placed third. Amandala sat down with the Borlands to find out what goes into making a great rider. Joel Borland, who is 21, told Amandala that he has been competing for about seven years now: three years as a junior and four years in the elite category. The Belmopan Digicell 4G LTE team consists of eight members ranging in ages from 20 to over 40 years old. Borland outlined, “In a race, there is not one steady pace that is ridden; we have developed them into zones. The majority of training is done in zone two, which is the endurance zone, while zone four is the threshold training, which is training almost at 100% of your aerobic capacity”. “Aerobic means that you are making use of the oxygen that is available to your system,” Borland explained. It was the fourth time that Joel participated in the Cross Country race, which took place on Holy Saturday. Joel admitted that the Guatemalans were too strong for him to overtake during this most recent race, but going forward, he knows what he needs to do. Joel said, “I could not handle the acceleration that happens after 130 miles, so I need to work harder on my endurance and my aerobic capacity to handle the attack after 130 miles, since it is the key to winning a Cross Country”. “You have to have that same level of high intensity when the race begins, and you have to do that later on in the race,” he noted. Joel attributes his success as a cyclist to his father loving affirmation, his disciplined regime, and he mentioned that he has come to adopt that same disciplined attitude in his training. Joel is attending the University of Belize, where he is pursuing a Bachelor’s degree in business management. He said his day starts at 5:30 a.m., at which time he gets up and rides for two hours. After returning home, he gets ready for school; it is a challenge, especially when he needs to stay up late at night to do schoolwork, he said. On weekends, Joel said, he gets up at 6:00 a.m. and trains for approximately five hours. But in spite of the hard work, sacrifices and challenges, Joel has come to realize that the discipline involved in training for the race has great benefits, since it develops one’s character, and for this reason he encourages other young persons, to take up a sport. When he started cycling, Joel had no prior knowledge of the sport; he just immersed himself into it. The support, Borland said, “shouldn’t be haphazard; instead, it should be structured, organized and have a clear direction”. “After all, they could have invested their energy in something we could be less proud of,” Borland said. The family is a fundamental part of the support system, Borland explained, and continued by saying that his team focuses on families by bringing them along to events. “The mission then becomes a group effort, a team effort, a family effort, and if you don’t have that, there won’t be much success”, he said. With reference to the financial implications, Borland explained that cycling is an expensive sport, but it comes with several opportunities, as many doors usually open up to the cyclists – during and after the competition. As for Joel, he was introduced to cycling by his dad at the age of 15, and since then he has developed a passion for the sport. It all began when his father was at the point of giving away his bicycle, but Joel asked to keep it. A few years later, it was his win of the junior Cross Country in 2011 which got him really interested in the nation’s biggest sporting event, the Holy Saturday Cross Country race.